I was looking at a unit. This unit was layered, metal - glass - metal - glass - metal. With the glass one could see inside. I was looking at it and I was told, “All you are (meaning this group) is in there.” The unit was packed or compressed full of our clothes, all kinds and I remember seeing red clothes. All we are was represented as clothing, no flesh was in the unit. The unit had atmospheric gauges on the outside, revealing the atmosphere inside. Those gauges were in the middle metal part of the unit. We did not understand what it all meant when the scene was given, but through time we have come to understand much. 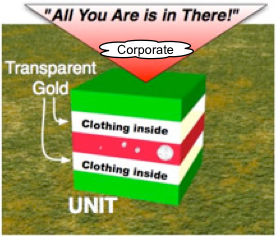 The glass is transparent gold, which has to do with pure gold, refined gold. The atmosphere, as we learned later, is silence and must be maintained every moment, the reason for the gauges. The gauges in the red section have to do with covenant, maintaining silence, etc., the Lord’s way. Clothing represents our acts and the picture reveals that what the Lord wants is our acts, no flesh of any kind. We must not forget the military green so we know there is military action, a war to be won by the Lord. The importance of all of this can be seen in the following testimonies. Here is a word of the Lord that He is illuminating. Grapeland TX, Begin with silence before the LORD; don't be presumptuous, don't cause a commotion. (This has to do with meetings.) Reverence through silence. I will speak to you what needs to be spoken, when it needs to be said. This is for all. I AM supreme. I AM in charge. It is MY meeting. Superstitious = your interpretations. Seek ME. It is the plain spoken truth. Reverence in MY sanctuary. Where is MY sanctuary? Where you meet with ME. You shall keep MY Sabbaths and reverence MY Sanctuary, I AM THE LORD, Leviticus 19:30. Holy, Holy, Holy, I AM THE LORD ALMIGHTY…. ...The watchman saw we were to “kneel.” Then the Lord revealed why we were kneeling, “for all mankind.” HE said, “I accept.” Seen next, “will’ & “power” Saw, “together (a) force.” Saw, “succeed.” Saw, “justice.” Saw, “complete exposure.” Thanked HIM for calling us to wed. Saw, “Mercy, grace.” Saw a hand just swooping down & up, “One fell swoop.” What do YOU mean? “I have MY Bride.” “Moses” What about Moses? “Promised (land)” …. We were well into a meeting when the section above happened. Because of past experiences some of these words caught my attention, but I knew I could not think on them during the meeting. We needed to keep following the Lord step by step. After the meeting these words began to intrigue me more and more. “I accept,” reminded me of when the Lord said He would account the first Marriage Feast in 2005 as the first one. Why did the Lord bring up “Moses”? I knew there had to be more information given for understanding. 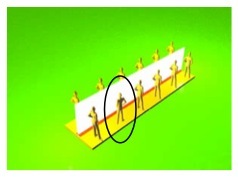 There were some people standing close together in a cluster, in the middle of a room. Outside the cluster were some brown paper bags sitting on the floor. I began moving things that had hindered “the purpose” away from “the purpose,” which was in the center of the cluster. I moved the paper bags away and began to move people away, one by one, until there were only two or three people standing in the middle. I think three. They were standing in the purpose, like being in an aura. They were the only ones that had not hindered the purpose. Coming out of the scenes I suddenly knew why the Lord had brought up “Moses.” I was sure I was right about why the Lord had said, “I accept.” The next day I looked up the following scripture so I’d have it. To complete the picture a little more, we always meet after a Golden Meeting "in Him" and go over things. People report things they saw and heard. We learn a lot this way. Anyway, there was a lady who was talking about how she had prayed as we knelt. I knew it wasn’t correct according to what the Lord was teaching us, but I didn’t say anything at that time. I also felt that I had not done it correctly. The two scenes the night after the meeting brought to light that only three people had not hindered God’s purpose of having us kneel as a group. I decided to have a questionnaire at our next ministry meeting. There were some things I wanted to see people’s answers to anyway, so I could tell if we were on the same page, so-to-speak. I also asked them if they prayed when they knelt during the last meeting. If you (or a corporate body) are in a Golden Meeting and the Lord tells you to do an act, do the act without presumptions or interpretations. The Lord doesn’t need our help, just our obedience. Now we have a more illuminated picture of why the Lord was showing us a military unit with nothing but clothing in it. Clothes represent acts and all the Lord wanted from us was our act of kneeling, nothing more. The battle is the Lord’s, but the ways of the Lord are not carnal. The Lord will move in a mighty way just as He did when Moses held up his hands if we will obey Him in what He leads us to do. Just don’t forget the agenda is His and His alone! Another reason I wanted to hand out the questionnaire mentioned in the last witness was to find out for sure whether I was one of the people who hindered the Lord’s purpose. I thought I was one who hindered and knew if I could find out for sure it would shed some light on another element we need to understand. Grapeland TX, ... Reverence through silence. I will speak to you what needs to be spoken, when it needs to be said. This is for all. I AM supreme. I AM in charge. It is MY meeting…. It takes a humble person to walk completely in the above. Some have said, “But you can’t have a blank mind.” No, you shouldn’t and you should not be trying to. If you are listening you don’t have a blank mind! Listening and responding is fairly easy when done correctly without “self.” When the Lord told us to kneel, we did, and all we had to do was to wait and listen. The Lord was quick to tell us why we were kneeling. We didn’t need to ask. (In this type of situation we must realize that the Lord is in charge and He will give everything necessary. This is the confidence we must have in Him.) After the Lord told us why we were kneeling we were to be listening for the next instruction, which in this case was to get back up. This was revealed by His next word to us. Grapeland TX, Begin with silence before the LORD; don't be presumptuous, don't cause a commotion…. A brother who was at The First Marriage Feast told me the Lord was showing him thoughts to “scream,” (in the spirit realm). I have had trouble discerning what it is about our thoughts and minds that the Lord wants, the do’s and don’ts. I have realized some things about thoughts and I’m sure they will help you. The Lord told one lady who was having trouble to listen with her mind. Listening is not a thought. I tell people they have to be aware all the time of the corporate body and everything it is doing in a Golden Meeting. The group can then become the Lord’s Bride, one person, fitly joined together. Remember, when one person misses it, there is no fusion, no victory. 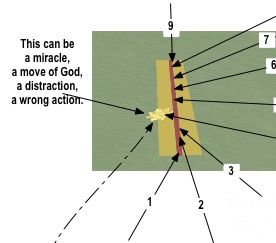 In the scene to the right, one person missed the command (for whatever reason) and there was no fusion into the Lord! Constant awareness of what the group is doing is not a thought, but observation. A thought is something generated by your mind and I believe that is a big clue. If a person is being aware of what the corporate body is doing and suddenly thinks, “That person should not have done that,” they have produced a thought, have gotten into self, and taken their eyes off Jesus’ purpose. If we are focused on Jesus’ purpose, listening and responding correctly, then you most likely won’t fall into the “self” trap. I share another witness of being presumptuous, revealing how it can affect others and therefore the Lord’s agenda and purpose. I was in the room where we gather. We need a room to gather in because God is a God of order and we are to enter into the Lord as one unit, one person. People can’t just straggle into Him; we go in as one person, the Bride. So if we gather and let the Holy Spirit deal with different things among us, taking time to establish silence, then the group can enter the meeting room “in Him.” The Lord also told us we must have a cut off point when the meeting “in Him” ends. We have found that leaving the meeting room, going back into the gathering room works well. Anyway, some had arrived earlier and some had just come into the gathering room. I realized I needed to get focused on the Lord and as I began to I realized I had parts of a song going through me, loud and clear. The message was, “We are coming through!” It was to the tune of, “Jesus and His children are coming through.” I should have started singing, “Jesus and His children, we are coming through,” (changing the words). I didn’t, but presumed it was too early for that and figured I’d watch for the place it fit into the meeting and do it then. That time never came in either room. I figured it was a general message to us that we were coming through and the Lord was encouraging us. As I have said, we go over things after the meeting “in Him” is over. We have learned so much this way and I would recommend it if you are working to learn all of this in/as a group. After it seemed everyone was done sharing I mentioned I had a song at the very beginning, one might say before the beginning. I explained the message of “We are coming through,” revealing the song phrase Jesus and His children, we are coming through, as well as some of the next part I had heard concerning the angels and glory. I mentioned that it never fit into the meeting as far as I could discern. One of the ladies then began telling me I should have sung it right at the first in the outer room. She had missed a couple of meetings because of a death in her family and things at work were very trying for her. She needed a boost to get back into what was going on here and she knew it when she arrived. She told me the song, with the words changed, would have ministered to her by giving her that boost she needed. It would have been great to have had that right at the first. I realized the Lord knew all of this about her and I had let Him down. He would have received the credit had I delivered the song with the words He gave, when it was given. The lady didn’t receive the ministry from the Lord because of my presumption. It goes back to listening and responding correctly as we have been taught. It goes back to the principle of what the Lord said: I will speak to you what needs to be spoken, when it needs to be said. Now I should mention that sometimes the Lord will give something and tell us to wait. I am sharing these mistakes, revealing elements, in the hope we can learn from them so the Lord’s ministry can happen without interference during the meeting. It is His ministry in the earth, not our ministry or the church's ministry. The Body of Christ needs to learn to let Him minister in a way we never knew of before. I will share another time I got into “self” concerning something the Lord was dealing with us about and didn’t realize it. It was brought up that we hadn’t learned to respond to the Lord correctly. I decided I was really going to watch and try to learn all I could about responding correctly. At the next meeting I remember thinking about it before going into the Lord, wanting to learn and not miss anything. To my surprise the Lord dealt with me in the night after the meeting. Suddenly I knew I had taken “my agenda” into the meeting, not realizing it. My agenda was to learn how to respond correctly, my focus was there part of the time, not on what the Lord’ was doing. I thought I had good intentions to learn an important element; I had erred. It was a Kingdom Meeting in Him; the Lord was in charge and had the agenda, but there I was with my agenda. This was not in a Kingdom Meeting, but in our regular ministry meeting. We had stood to pray and one of the people motioned us to gather in tight like we do when we are as close to being one in the physical as we can be. We have learned a way of doing it that is closer than shoulder to shoulder. We had a silent time with the Lord and later the individual who had motioned to get us together gave his testimony of what happened. Years ago God said, “I am looking for obedience, not accomplishment.” He is looking for “a unit” without flesh, without self, full of the acts of obedience towards Him. He is our Commander and Chief! 2nd Scene, I was looking at a corner inside a house in which people had entered to have a meeting. There was a cloth bag with (I assume) ministry information in it, like our scribe sometimes carries. Someone had brought it and set it beside the brown paper bags that others had brought. (I don’t think the cloth bag was our scribe's, I’m pretty sure it was different colors, but then it may have been.) I couldn’t see what was in the paper bags, but they probably contained different items which people had brought. There was a railroad track about a foot, maybe a foot and a half wide, that ran around the outside of this room. The cloth bag was sitting directly on the outside rail and the paper bags and some other items people had brought were close to the track, not on it, but close enough to be hit by the train when it came. I knew the train had to make it over the tracks, making a full circle around the outside of the house or room, whichever it was, during the meeting. Simply put, the meeting was not over until the train had passed over all the track. In the scene I moved the colorful cloth bag, all the brown paper bags, and various other items back from around the tracks so the train could pass without hitting anything, without hindrance. When I awoke from this scene there was something about the two tracks that hounded me. It seemed one was different than the other. The only thing I could think of was that the right could represent spiritual and therefore the left would represent the physical. That would not negate the meaning that the rails represent the Law, or God’s Word; in a meeting they would represent the Lord’s instructions. The Spotless Bride (Train) does run on the Lord’s Words in a meeting, from the beginning to the end. This was pretty much my thinking on the dream until the following happened. In a Kingdom Meeting on 10-23-2009, as we were singing ZION the psalmist heard the Shofar, like it was in the distance. (This was reported after the meeting.) After Zion the psalmist whispered for the shofar to be played, explaining to the person playing it that they were to blow a single note blending into the music clear through the song. The psalmist then started playing THE WIND OF YOUR BREATH and soon the shofar began playing the single note. After playing a short while the psalmist quit playing the keyboard and as the shofar continued the psalmist begin playing again. She said she was surprised the player of the shofar could play a note that long and became focused on the shofar playing so long and actually quit playing. She had become distracted as the picture shows and off the path. We all knew we were learning and that we were going to have to be cognizant of everything the Lord had taught us about flowing with Him in a meeting. This was rehashed at the next ministry meeting on 10-26-2009, to have the psalmist encourage me to write about this so people could understand. I didn’t know it, but there was more to this picture than missing an “element.” The next morning the Lord brought up the dream of the train going around the room and that it did have to do with the meeting we are talking about. I knew the dream indicated that the Lord was going to use me to remove things of man that would hinder the flow of the meeting away from the tracks. If I was correct about one track being spiritual and one track being physical then the picture painted could be the melding together of the spiritual, the Lord’s word (instructions), into the physical and vice versa, as the Bride/train moved forward. I knew vice versa would be important if what I was saying was true. Knowing the shofar is sometimes used for a call, I looked at this knowing that in a marriage the two become one, that the Lord was revealing we had become one with Him for a time, that “it is Holy.” This fits the picture of the Military Unit we are to be. Nothing but clothing (acts) done in silence, which is a must to enter into the Lord in a meeting. You cannot put unholiness into the Lord because He is pure Holiness. The acts of instant obedience in a flow are “faith alive” and Holy. I didn't know it but the Lord wasn’t done yet! “Continue to walk on this higher plane. Soon I will be leading you into a deeper depth of ME. Soon you will be so intertwined you won’t know where one begins & one ends…. ...I am calling you out to become one with Me. Did I not ordain it from the beginning? Have I not made it possible? Do not think this is not so! Did not the Father say in marriage that two become one?…. The Lord has made an announcement in a way we can know it was His personal call! Not to distract from this highly important event, I share more about “self” and more insight into how self could become involved when we don’t want it to. This is a bigger picture, and I hope the writing below brings more realization of the fact that the Married Bride is about conducting her part of the Lord’s business on earth. When we were singing the song: WHEN WALKING WITH YOU, on the word ‘magnify’ I was signaled to blow the shofar. 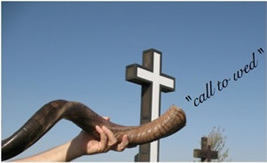 After the meeting the watchman revealed that when the shofar sounded the words, “call to wed” were seen coming from it. In this we can see the involvement of three people to bring forth what the Lord wanted to do. This has to do with the corporate body being fitly joined together, working as a unit, with the Lord being the head. The next morning the impact of what had happened was hitting me. I realized I was thankful I didn’t know the purpose of blowing the shofar. Had I been told beforehand I would have been into “self” instantly, trying to figure out how to blow the horn. I hope you can see that. Years ago I was given a shofar and the Lord has had me blow it at times. I was thinking I should learn all the protocols and different ways to blow it for different things. I was wrestling with this thinking, I didn’t feel I had the time to do that and to practice. The Lord intervened and said, “Just blow it!” I have blown it a lot of different ways with the help of the Holy Spirit. All I can say is that if the Lord says to blow the shofar, the way to blow it correctly will be there if you are depending on Him and not leaning to your own understanding. This is not to say one shouldn't learn the different sounds. In this we can all be thankful that the Lord does not always tell us what He is doing before hand when we are in Him in a meeting. When He had us kneel for all mankind He gave the reason we were kneeling after the command to kneel. Two people had to be obedient in sequence before the words “call to wed” were seen by a third person revealing the Lord’s purpose. In one meeting the Lord had us push back the antichrist because he was trying to come too soon. I could give a few more instances, but the important thing to see here is the picture of the Bride working with the Lord concerning kingdom things, without “self”. It all goes back to understanding the elements, the protocol, the boundaries, and instant obedience the Lord wants in His unit-without self.